In Skateboarders v’s Minimalism, Shaun Gladwell once again confirms his idea that the only worthwhile art is that which involves the body, and on an intense level. Beyond its spectacular dimension, sport is an exercise that aims for both health and self-transcendence. We need to get our body-machine working at full capacity to exploit its full potential, to make it comfortable with its own nature. And that is precisely what is done in this new video, featuring Rodney Mullen, Hillary Thompson, and Jesus Esteban—three of the world’s best professional skaters. This time, though, the context is singular, unexpected and unconventional. 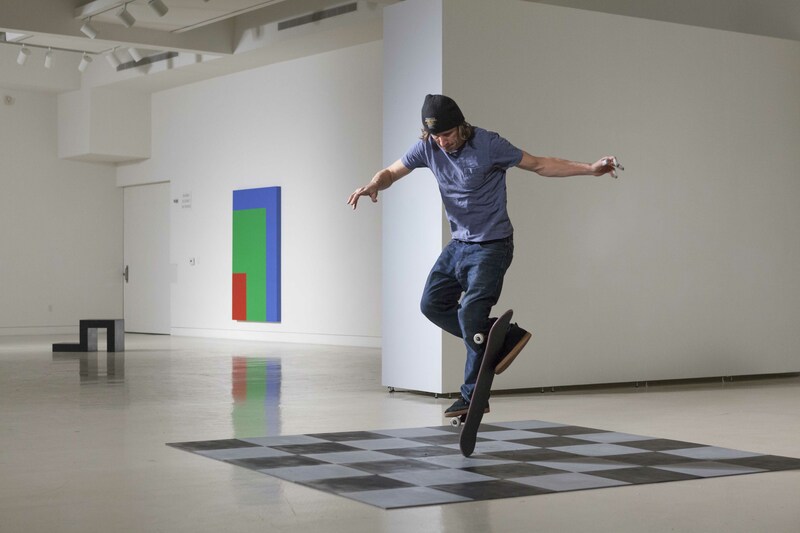 This time, the skateboarding is not in front of the roaring ocean, on the Pacific Seashore, nor in the street or on the undulating slopes of a skatepark—but in a museum. For as Gladwell says, for skateboarders, “the streets are our museums.” It is tempting to say that the human element prevails in this battle between body and object: it is the gesture that the eye is ultimately drawn to. As Paul Ardenne says, “the spectator, in watching the gestures of the skateboarders, becomes embodied in them, feels their effort, their joy, their pain, and sometimes, their exultation.” Thus the match between gesture and sculpture seems to be one that is rigged from the beginning. But Gladwell intentionally leaves the victor of this conflict open to interpretation. By bringing museum culture and extreme sports culture into direct confrontation with each other, he tempts us to declare a clear winner, or even to fall into the trap of dismissing the comparison as absurd or irreverent. But for Gladwell, there is no inherent difference between the gesture and the sculpture: both are part of the same creative force. “With creation comes destruction. The sculptors create, and perhaps destroy the norms and traditions of those who came before them, while the skateboarders create, and in doing so, must destroy the sculpture, their boards, their own bodies.” The superficial conflict in Skateboarders vs. Minimalism reveals something deeper, more essential to human nature: the fundamental creative and destructive force that underlies all artistic expression.Mais Gladwell fait exprès de laisser ouvert à interprétation le vainqueur de ce conflit. En mettant en confrontation directe la culture du musée avec la culture des sports extrêmes, il nous invite à déclarer un gagnant incontesté,ou même de tomber dans le piège de rejeter la comparaison comme étant absurde ou irrespectueuse. Mais pour Gladwell, il n’y a pas de différence inhérente entre le geste et la sculpture : ils font tous deux partie de la même force créative. « La création ne vient pas sans destruction. Les sculpteurs créent, et peut-être détruisent les normes et les traditions de ceux qui les précédaient, pendant que les skateboarders créent, et en ce faisant doivent détruire la sculpture, leur skateboard, leur propre corps. » Le conflit superficiel dans Skateboarders v’s Minimalism révèle quelque chose de plus profond, de plus essentiel dans la nature humaine : la force créative et destructrice fondamentale qui est à la base de toute expression artistique. Shaun Gladwell is an artist who deals with the body and with movement; an artist whose work embodies the supreme gesture, as Carolyn Christov-Bakargiev stresses in her analysis of his work. In addition, according to Simon Rees, he sensitively deals with the body’s memory. Gladwell’s is an ‘absolute’ body that he likes to push to and make manifest at the extreme limit between life and death. In the title of one of his very first videos, Riding with Death (Redux) 1999-2011, and in his celebrated video Apologies 1-6, 2007-2009, the body on the brink makes its appearance. Crossing Australia by road suddenly becomes, in the eyes of both the eyes and his audience, the equivalent of crossing the river Styx. Gladwell, the archetypal body poet, uses leitmotifs such as body handing, sometimes with arms crossed, a body suspended between life and death. The body appears in multifaceted incarnations: a machine body; a biker-body; a virtuoso body; the body as a weapon. Each of these variations, identified by Paul Ardenne in his essay on the poetics of the body, form an endless performative creation, which Gladwell sometimes takes to the point of losing consciousness. Gladwell, however, is never out of control. Loss of consciousness is nearly enacted, always carefully assessed, calibrated, controlled and mastered. Even beyond movement, Gladwell, as an artist, is above all concerned with mastery. Through mastery of the body, he seeks to achieve mastery of time. To that end, slow motion is an essential element in Gladwell’s work. Gladwell uses filmic devices such as slow-motion and long pans to capture performances, both tightly choreographed and improvised, by break dancers, skateboarders, and BMX bike riders, in a combination of rural and city settings in Australia, Japan, Brazil, France and Afghanistan. The resulting works, which he describes as “performative landscapes” are both rhythmic and poetic—distorting speed, gravity, space and time; exploring visual and spatial paradoxes. In 2009, Shaun Gladwell represented Australia at the Venice Biennial and was sent to Afghanistan as the Australian Official War Artist. Gladwell has exhibited Internationally in venues such as the Royal Academy of Arts (London), the Orange County Museum of Art (CA), KUAD Gallery (Istanbul), Palais de Tokyo (Paris), and the Museum of Lyon (France). Gladwell’s work is included in the public collections of the Art Gallery of New South Wales (Sydney), Museum of Contemporary Art (Sydney), Museum of Contemporary Art (Tokyo), Museum of Fine Arts Houston (TX), Orange County Museum of Art (CA), Progressive Art Collection (PA), SCHUNCK (Heerlen), VideoBrasil (Brazil), Wadsworth Atheneum (CT), among many others.